Corrine Dickson graduated in Podiatry from Queen Margaret University in Edinburgh and began her career working in the NHS as a podiatrist for two years. She then went on to work in a successful private Chiropody and Podiatry Clinic in the heart of Edinburgh, where she specialised in bio-mechanics and nail surgery. After moving to Lancashire, Corrine has been working in Pendle Chiropody Clinic and running her own mobile Chiropody service in Colne. 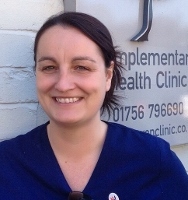 In April 2016 Corrine started her practice here at the Craven Clinic, providing Skipton with the very best treatment in Chiropody and Podiatry. Her treatments include a full lower limb assessment and Health check. All Foot care treatment will be personalised to each patient’s need but will include nail care, skin treatment and end in a relaxing foot massage to help circulation and skin condition. Corrine is an HCPC (The Health and Care Professions Council) registered Podiatrist, also a member of The Society of Chiropodists and Podiatrists. So you can rest assured that you are in safe hands. Standard prices range from £25 to £225 depending on the treatment booked.